Abigail Adams holds an honored place in American history, not only for being a First Lady of the United States, but for the invaluable letters she left behind. Through her writings, people today can experience what it was like to be a woman, a mother, and an American in the early days of the United States. 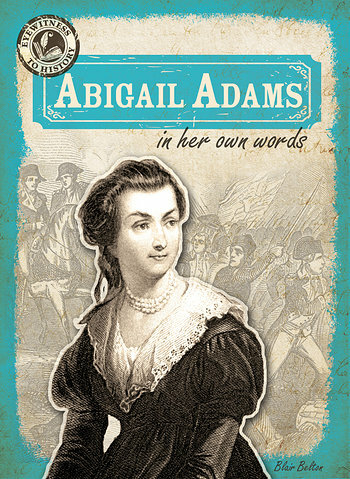 This fascinating look at Abigail's life uses primary sources to expose the wit, intelligence, and opinions of this early advocate for women's rights. Sidebars, fact boxes, and a timeline further provide evidence that this "founding mother" is a must-know. This biography of Abigail Adams focuses on her writings, but is also gives readers some historical context. The book begins with a two-page introduction to Adams before it moves on to some of the events she witnessed and chronicled in her letters to her husband, John. She describes revolutionary activity, a meeting with George Washington, and even the sadness one of her children feels when he doesnt receive a letter from his father. Along with her well-known feminism, the book also demonstrates Adams antislavery positions. Many short sidebars explain more about what was happening in the country at the time. An approachable format, illustrated with interesting pictures, gives further appeal.